Trying to recap an episode of The Bachelor is like trying to figure out where to start with cleaning my post-wedding apartment. I am overwhelmed at the thought of creating some kind of order, but I know that the first five minutes will be the hardest. Once the ball is rolling, each little piece of the trainwreck will find its place. Tonight, we got to meet the world’s most underprepared Bachelor– second only to Juan Pablo, who had literally no idea what he signed up for. I think at one point JP even said the words, “I didn’t agree to world knowing all the details of my relationship and how I feel.” LOL, Juan, fire your translator. Anyway, Ben Higgins is about as innocent as they come, at least on this show. First of all, as gathered from his powwow with Mom and Dad, he was raised in a house where they drink water out of giant, colored plastic cups– something to which I can relate– which only means that he is not nearly aggressive enough to handle the chaos that Hollywood producers are about to throw his way. Glassware is generally a pretty solid indicator of maintenance levels, and Ben’s enormous colorful cup screamed, “I sometimes wear socks to 7-11.” Unfortunately, most of his female suitors seem like Aquafina-out-of-a-glass kind of girls. (Translated: Full eye makeup to 7-11.) The exception is the token farmgirl, whose answer to “How do you beat [the excitement of] twins? ?” was “With a [bleeping] mini-horse. That’s how.” Obsessed. Because the advice of parents who have been happily married for 32 years was not sufficient, Ben turned to his Bachelor bros: Jason Mesnick, Sean Lowe, and Chris Soules. “Three of America’s favorite Bachelors.” Nottttt the most solid introduction by our script writers. If I remember correctly, America kind of hated Jason after he proposed to one girl at the end of the show, then dumped her on live television two months later during “After the Final Rose” in order to get together with the girl he originally gave 2nd place. In all fairness, Jason and #2 are now married with a baby, but…one of America’s favorite Bachelors? I think not. Despite the questionable merits bestowed upon them, these three ex-Bachelors gave Ben the best advice they could muster. From Jason: “Follow your heart.” (Perhaps before you propose to the wrong person…) From Chris: “Kiss all of them! !” Direct quote. He’s the only one of the three who wasn’t successful on the show, which is..shocking. From Sean: “Don’t kiss girls in front of other girls.” Always has been, always will be, the Golden Child. A woman confidently standing in a parking lot, staring into the camera with her best Beyonce glare, as a man on a unicycle rode in circles around her, all the while playing a fire-emitting bagpipe. A young lady who raises chickens like they’re fluffy teacup toy poodles. She nuzzles them and cuddles them and has a “special” chicken named Sheila, who sleeps in her bed. The first limo pulls up to the mansion, and we see the standard montage of champagne and giggling and girls randomly yelling “Ben!” in unison because…they can’t find him? Unclear. Chris Harrison and his pinstripe suit leaves a nervous-looking Ben alone in the driveway to meet each of his eager wife-to-bes. Lauren B— Flight attendant who I predicted to be a wallflower, but was actually quite assertive. She gives him a pair of pilot wings to “take off on this journey together,” which is not the first metaphor/pun of the season, nor will it be the last. Caila— I predicted her to be a favorite, and I hold to it. She jumps into Ben’s arms like a baby because unlike me, she is not bottom heavy, and has no fear of being carried. She is also featured in every “coming up next” teaser, saying the girls are “Fifty shades of crazy” in her best thug voice, when in reality, she has about as much street cred as Hilary Duff. I love her. Jennifer— She rhymes Ben with Jen so that he can remember her name. Obviously too young to remember Bennifer. Jami— She is friends with ex-Bachelorette Kaitlin and makes a sexual joke because I guess that’s what all Canadians do. Ben knows he has to keep her around so that Kaitlin doesn’t send him a mean Tweet or something. Sam— A lawyer who already has no voice, which we can assume is a result of the free booze in her hotel room, and her need to talk constantly, as we discover throughout the episode. Jubilee— Arrives in a floor length white jersey dress and booty-short spank lines for us all to see. Undergarments matter, Jubliee. Amanda— The mom. Classy black dress. Simple introduction. Too normal to be here, other than the fact that her voice sounds exactly like Alvin the Chipmunk. Lace— We found out that her name is, indeed, pronounced like the material. And remember, this is the girl who talked about her poop in her bio. She makes Ben close his eyes, then plants a kiss right on his lips so that she could claim the “first kiss.” He looks a little pissed. Lauren R— Like I predicted, no social skills. Refuses to tell Ben her name, but thinks telling him every fact she learned about him while stalking him online is a solid opening. She was wrong. Shushanna— Speaks in Russian the whole time. Ben just says “yes” a lot, which– from what we saw in the subtitles– was luckily the correct answer to most of what she was saying. I don’t think Ben particularly cared if she spoke English because she was so pretty. Leah— The girl who twerked in her audition video decided to hike up her dress, bend over in front of Ben, and hike him a football. Nobody is surprised except for Ben, who scans the driveway for an adult. JoJo— Wears a unicorn head when she gets out of the limo, but obviously hates this idea and is annoyed with the producer who made her do it. Ben feels bad for her. They have a cute chemistry. I called her as the next Bachelorette, and as of now, I’m sticking to it. Lauren H— This is the kindergarten teacher who we can assume will freeze her eggs if she’s not married by age 25. She gives Ben a bouquet of wilted flowers and says she caught the bouquet last week at a wedding. Raise your hand if you believe her. Laura— The red head. I had high hopes for her, especially when she stepped out of the limo in a flattering navy blue dress. Then I saw her crazy eyes, and so did Ben, and things were over before they started. Mandi— You’ll remember her as the girl who looks like a chicken, and says a free range chicken is her “spirit animal.” Not to be confused with the girl whose career is “Chicken Enthusiast.” Mandi wears a two foot rose on her head and tells Ben he can pollinate it later. He doesn’t know what that means, but he doesn’t like the sound of it. Twins— I’m bored with the twin thing before it even starts. They talk in unison and giggle, then Ben asks if he should treat them as a package deal or if he should get to know them separately. I feel like maybe they should’ve been offended, but they most definitely were not. Maegan— Cowgirl who brings a mini-horse with her. The place is looking more and more like a freakshow every second. Breanne— Brings a basket full of bread and says, “Gluten is Satan, so lets break bread,” then proceeds to bang loaves of very stale bread on the side of a nearby stone wall. God help us all. Izzy— Wears a onesie, and asks Ben if “he’s the ONEsie.” At least she looked comfortable. Jessica— Gets out of the limo and tries the Britt (Chris’ season) tactic of giving Ben a really really long hug. Her delivery does not have the desired effect. This may have to do with her lack of plush fuschia lips or doe eyes. Tiara— She chooses not to bring up the “Chicken Enthusiast” thing right out of the gate. Smart girl. LB— Amazing cheekbones. Southern accent. She’ll be here for a while. Jackie— Presents Ben with a Save the Date for their engagement. He looks overwhelmed. I’m going to plow through the rest of the night because, to be honest, the first night is pretty predictable. Lace and the chicken lookalike get drunk. Olivia the News Anchor gets the First Impression Rose. Becca and Amber from Chris’ season show up, and the girls feel threatened. Becca is still a virgin, Amber is still forgettable (but her styling is on point tonight). 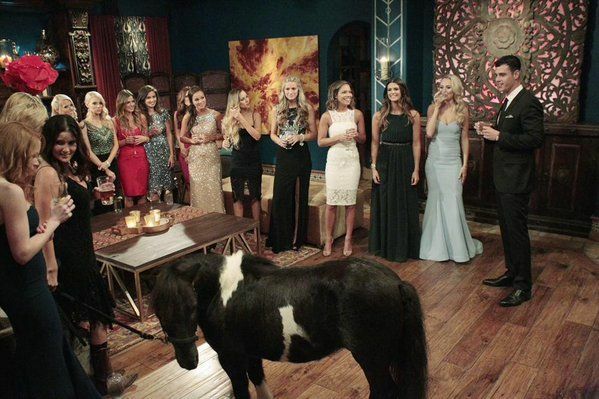 Chris Harrison befriends the miniature horse. Laura the red head. She blames her red hair instead of her crazy eyes. Breanne, my original pick for Top Villain. Lauren R., whose bio revealed her lack of social skills. Maegan and her miniature horse. The night wraps up with Lace pulling Ben aside to complain that he didn’t make eye contact with her during who whole rose ceremony. Ben looks utterly confused and exhausted as she’s talking, which makes sense because it is now morning-time. My theory is that, besides the fact that this girl is nuts, she can probably tell that Ben only kept her because the producers told him to do so. A woman’s intuition is strong. Ben needs to work on his acting if he wants to avoid more insecure freak outs this season. In the final teaser of the night that highlighted what the next two months hold in store, we see hot air balloons, private planes, helicopters, hot tubs, yachts, and expansive cliff shots. Looks like The Bachelor economy is thriving. We also see three different girls tell Ben that they’re in love with him, seemingly on week 4. I fell in love with my husband after just a few weeks, too, but he wasn’t dating 27 other women at the same time. Details. Episode 1 is always the hardest to follow, but I hope this helped make sense of what you just witnessed. See you next week, when things really start getting interesting!